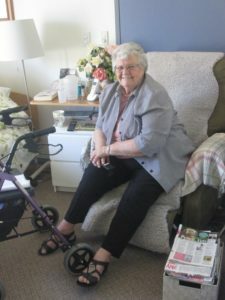 January 2018: Mum (Norma Aitken) at Alton Lodge, Nursing Home, Cooranbong in January 2018. 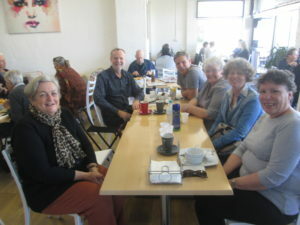 Mum with Gerald Aitken … Mum’s second son) and Helene his wife and Ken Aitken (Mum’s first son) Harriet his wife. For me, it is a unique time that was very foundational from a personality and character point of view. It is very much my account and my three brothers would have very different memories and would have had different focuses. 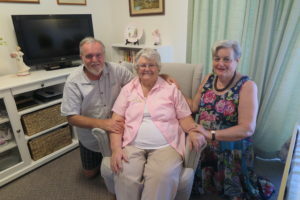 August 2018: Harriet and I had driven down over two days from Brisbane to Coorangbong to see Mum in Alton Lodge before we went our holiday to Switzerland in September. 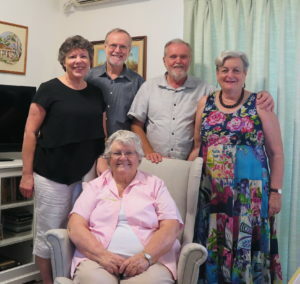 My brothers Gerald Aitken … (Mum’s second son) and Helene his wife and Ken Aitken (Mum’s first son), Harriet his wife and Rick … (Mum’s third son) and his wife Di came up from Sydney to see Mum over three days. 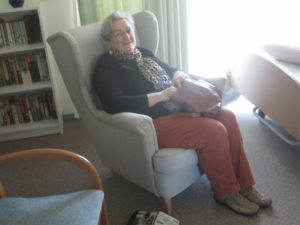 Harriet, Ken’s wife sitting in Mum’s room. All of us having lunch around the corner at the Elephant Cafe in Cooranbong.